The Craft Room has swung open its Melbourne doors. The first Learn to Knit class was held last week and although somewhat boutique in size, a good time was had by all. To take a break from the concentration involved in learning to cast on, knit, purl, etc. we had a short break at the mid point to have a wander around Amitie Fabrics. Perhaps in retrospect this was not such a good idea as I managed to spend most of my teaching fee in 10 minutes flat. Of course, money spent on fabric and wool is not real money, is it? The next class is being held this Saturday morning, again at Amitie. Further class information plus booking details can be found here. Of course, Saturday is also Federal Election Day. Let's hope the newly elected government has a sounder economic theory than mine. Oh my that tunic is stunning. Fancy making me one too?? Glad to hear the class went well. 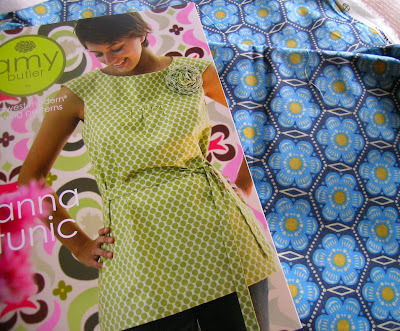 Isn't that Anna Maria Horner fabric divine! I will be working on Saturday so see you then! The Craft Room sounds great! I think I understand your fabri-nomic theory more than most economics I've heard spouted the last few weeks.